Arthritis is a common condition causing pain and inflammation of a joint. The most common type is osteoarthritis (‘wear and tear’ arthritis), which usually affects adults who are 40 or older, but can occur at a younger age e.g. after injury. The loss of cartilage in osteoarthritis causes pain and stiffness and makes movements more difficult. In severe cases the shape of the joint may become altered, and bones may be forced out of their normal position. Rheumatoid arthritis is the second most common type which occurs when the body’s immune system targets healthy joints causing pain, inflammation and stiffness. It occurs usually in middle age and more frequently in women. Although any joint may be affected, the small joints of the fingers, thumbs, wrists, feet and ankles are most commonly affected. A number of blood tests may be carried out in conjunction with symptoms to confirm the diagnosis. Living with arthritis can be challenging as carrying out simple tasks can often be painful and difficult. A healthy lifestyle will contribute to managing your arthritis. Healthy Eating: Eating a healthy and varied diet will provide your body with the nutrients you need and can help to control your weight. If you are overweight, losing weight can really help your arthritis by reducing the pressure on your weight bearing joints. Exercise: You may not feel like exercising if your arthritis is painful, however, being active can help reduce and prevent pain by improving joint mobility and movement, increasing muscle strength and reducing stiffness. Engaging in the right type of physical activity can help you lose weight and boost your energy levels. Joint Care: Whatever type of arthritis you have it is important to look after your joints to minimise the risk of further damage, e.g. distributing the weight of your shopping bags into both hands or in a backpack, or, using larger stronger joints to take the strain e.g. using your shoulder to open a heavy door inwards instead of your hands. For those experiencing difficulty with day-day tasks you may benefit from a consultation with an occupational therapist. They can advise you on a range of techniques and equipment that can aid with daily living. A podiatrist or chiropodist may offer support to those with walking and mobility issues. How else can we support joint care and relieve symptoms? 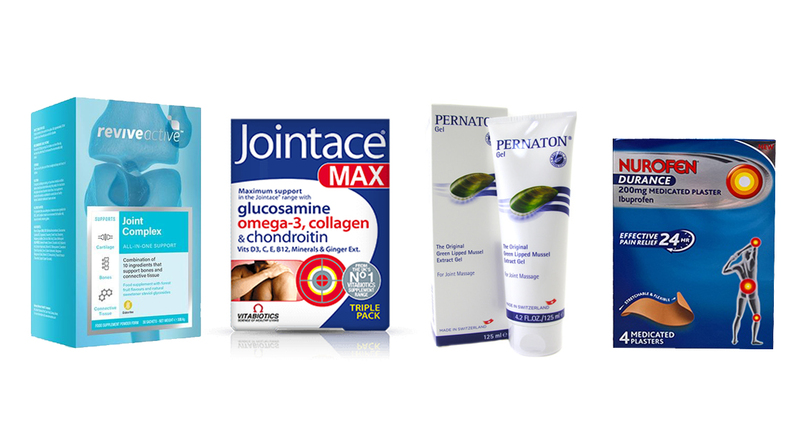 At Hickey’s Pharmacy we have a range of supplements and products designed to protect and support your joint health. Always read the label, consult your pharmacist for further information. Revive Active Joint Complex contains a scientifically formulated combination of natural ingredients including Marine Collagen, Glucosamine & Hyaluronic Acid which maintain connective tissue and help lubricate and improve joint function and flexibility. Vitabiotics Jointace Max provides comprehensive support to bones and cartilage including a super strength Omega-3 fish oil component ideal for those with and active life, in sport or in later life. Medicated plasters such as Nurofen Durance target pain close to the joint in the upper or lower limbs (patients over 16 years of age only) and provide pain relief for up to 24 hours. We also stock and source a large range of aids for daily living. Call into your local Hickey’s Pharmacy and speak to a member of our healthcare team.